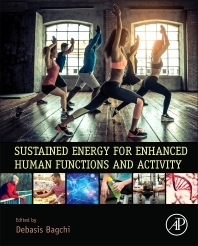 Sustained Energy for Enhanced Human Functions and Activity addresses the basic mechanistic aspects of energy metabolisms, the chemistry, biochemistry and pharmacology of a variety of botanical ingredients, micronutrients, antioxidants, amino acids, selected complexes, and other nutracueticals which have demonstrated a boost in and the sustainability of functional energy. The role of exercise and physical activity is also discussed, and the conclusion addresses paradigm shifts in the field and envisions the future. Intended for researchers and industry professionals, the book is as an essential reference on the impact of proper nutrient balance on sustained energy. Debasis Bagchi, PhD, MACN, CNS, MAIChE, received his Ph.D. in Medicinal Chemistry in 1982. He is a Professor in the Department of Pharmacological and Pharmaceutical Sciences at the University of Houston College of Pharmacy, Houston, TX, and Chief Scientific Officer at Cepham Research Center, Piscataway, NJ, Adjunct Faculty in Texas Southern University, Houston, TX. He served as the Senior Vice President of Research & Development of InterHealth Nutraceuticals Inc, Benicia, CA, from 1998 until Feb 2011, and then as Director of Innovation and Clinical Affairs, of Iovate Health Sciences, Oakville, ON, until June 2013. Dr. Bagchi received the Master of American College of Nutrition Award in October 2010. He is the Past Chairman of International Society of Nutraceuticals and Functional Foods (ISNFF), Past President of American College of Nutrition, Clearwater, FL, and Past Chair of the Nutraceuticals and Functional Foods Division of Institute of Food Technologists (IFT), Chicago, IL. He is serving as a Distinguished Advisor on the Japanese Institute for Health Food Standards (JIHFS), Tokyo, Japan. Dr. Bagchi is a Member of the Study Section and Peer Review Committee of the National Institutes of Health (NIH), Bethesda, MD. He has published 321 papers in peer reviewed journals, 30 books, and 18 patents. Dr. Bagchi is also a Member of the Society of Toxicology, Member of the New York Academy of Sciences, Fellow of the Nutrition Research Academy, and Member of the TCE stakeholder Committee of the Wright Patterson Air Force Base, OH. He is also Associate Editor for the Journal of Functional Foods, Journal of the American College of Nutrition, and the Archives of Medical and Biomedical Research, and is also serving as Editorial Board Member of numerous peer reviewed journals, including Antioxidants & Redox Signaling, Cancer Letters, Toxicology Mechanisms and Methods, and The Original Internist, among others.